A gaggle of ‘opium-addicted’ parrots are gorging themselves on crops which contain the precious narcotic, creating a real headache for Indian farmers. It seems a simple scarecrow isn’t enough to deter the avian gang of parakeets, however, which are known to consume entire poppy pods in one sitting. The livelihoods of poppy cultivators in the state of Madhya Pradesh are at risk at the hands – or claws – of the birds’ daily raids. The birds are consuming at an alarming rate, witnesses say. One poppy flower gives around 20 to 25 grams of opium. But a large group of parrots feed on these plants around 30 to 40 times a day and some even fly away with poppy pods. This affects the produce. These opium-addicted parrots are wreaking havoc. The birds have cleverly learned the farmers’ patterns of work and the growth of the poppy plants and descend at the opportune moment. Often the birds wait until the farmers cut the poppy pods to help them ripen, exposing latex rich in morphine and opium milk. In other cases the birds simply cut the stalks of the plant themselves and make off with the whole pod in their claws. Dr R.S. Chundawat, an Opium Specialist at a Horticulture College in Mandsaur, said opium gives the birds instant energy, much like when a human drinks tea or coffee. After the first hit, he added, it’s reasonable to assume addiction then takes hold in the bird population who have sampled the crops. Sad though the thought of a bird addicted to opium may be, the locals are also chagrined with the animals due to a significant loss of livelihood. Opium is the most lucrative crop farmed in the area of Madhya Pradesh with 38,000 of the 44,000 hectares of India’s licensed poppy cultivation taking place between the state and neighboring Rajasthan. And it is big business, which costs a lot in terms of getting licensed poppies to grow. So you can see why farmers would be worried if half the crop they’re paying to produce is getting eaten by parrots. After a number of attempts to scare away the birds failed, they are now are seeking the help of the authorities. We have tried making loud sounds and even use firecrackers to scare the birds. But nothing has helped. Nobody is listening to our problems. Who will compensate for our losses? 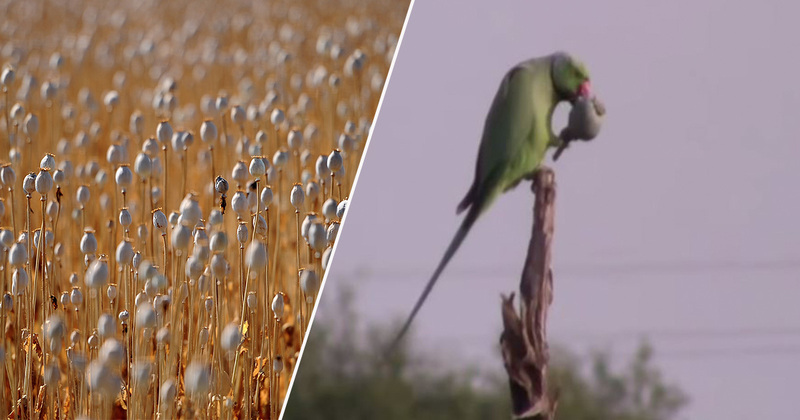 Birds have also raided poppy farms in parts of Rajasthan and the districts of Chittorgarh and Pratapgarh.